myGanBlog: Close to my heart. I have been having so much fun studying geometry with the children. Hearing them say "quadrilateral" and "parallelogram" is delightful. However, I was scrolling through Facebook last night and came across an article discussing a topic I hold dear to my heart, The Benefits of Helping Preschoolers Understand and Discuss Their Emotions. These types of articles are prevalent in the current conversation among early childhood educators. Around 20 years ago they were just beginning to be discussed. I was one of the ones discussing it. I felt like I was in a desert regarding this information. I am thrilled every time I see a current article on a topic for which I care so deeply. I take it as a very obvious sign: Yes Katie you are on the right path, continue. These are things I have done and do. There is no strict order or formula, sometimes it is a quick teachable moment, sometimes it requires a greater investment of time. A friend was very angry that he was last in line. Friend: I am not going to let anyone get the bike. If someone gets the bike I am going to be so mad I'm going to push them off. Me: Thank you for telling me how you feel, for saying you are MAD. I can tell by your face and your fists that you are very upset. I am not going to let you push anyone off a bike, I will help you use your words or find something else do while you are angry. Friend: Well I don't like being last in line, I am so grumbly. Me: I get it, I see it. What can you do differently at circle so you are not last to be called to line up? Friend: Not be so wiggly, and not talk so much when I'm not suppose to. Me: Yep. I agree. I know you will have a better time at story time. Friend: So now can I be at the front? Me: No. (Friend is pretty mad again.) As long as you walk calmly, and are paying attention the kids around you, you can be mad all the way to the playground. I hope you can turn your day around. My friend did; in fact by the time we got to the playground he was no longer interested in the bikes and began playing outside. Girl A: We are building a big castle, the animals aren't out anymore so instead of making a farm we are building a tall castle. Girl B: Yeah we are making it tall and using TRIANGLES!!!! And it is almost as TALL AS ME and I am pretty BIG. Me: You are pretty big and that is a tall castle. How did you balance the triangles? Girl A: Very carefully, it was hard and some fell but we kept trying. Girl B: Yeah we are pretty good builders. Me: You must feel so proud. Girl B: Yeah, that's it. HA! It's so tall and big and the triangles! Girl A: It is a pretty castle. This was a great opportunity to help define proud. The girls changed plans, kept at it and succeeded in building a very tall tower. Children are on the playground playing camp fire. Girl 1: Give me the rock. Girl 2: No I had it first. Girl 1: (screaming, crying) I want that rock. Boy 1: Here this is a cool rock you can have this one. Girl 1: I don't want that one, I want that one! Boy 2: How about this one? Me: Wow that is a lot of yelling. You are pretty angry you are not getting what you want. Look at your friend, look at her face. She doesn't look happy to be yelled at. Her head is down, she has tears on her cheeks, she doesn't want to look at you. You can be angry, away from the campfire, when you are done feeling so angry we can try to solve the problem. Girl 1: NO I WANT THE ROCK! Me: Ok. Well the boys offered you other rock options and you said no. Boys, it was kind of you help but she needs to decide to be happy on her own, right now she wants what she wants. After more scream/plead/demanding, Girl 2 gave Girl 1 the rock. Me: Wait, wait, Girl 2, do you WANT to give her the rock? Me: Then don't. If you from your kind heart feel like you want to give it to her then please share, but if you do not then don't. If your friend decides to kindly ask to share, you can still decide to share or not. You get to choose. You get to decide how you feel. Girl 2: I don't like being yelled at and she is making me feel like I have to give it to her. Me: I can see that, I see your tears. (to Girl 1) If your friend says NO, you can feel angry and frustrated, yelling at your friend probably won't be successful. When you are ready to use some calmer words we can try to find a solution. Girl 1: Well I just want the rock. So I'll go be angry over there and wait. It was unfortunate that she chose to angry, but she did decide to stop yelling at her friend. It was a good start, and good solution for this situation. A young friend has really been struggling with sitting calmly at circle. I expressed to her that her wiggly body worries me, she may hurt her friends next to her, or herself. She has been working at sitting calmly and saving the wild wiggles for the playground. Today she was the second child to be called to line up due to her outstanding calmness during morning circle. Friend: I did it! I sat really calmly. Friend: Should I pat myself on the back? I should pat myself on the back. Me: You should pat yourself on the back, you can be very proud of yourself. Being second is like being first, the leader of the day is by default always first. This girl did her best and had a direct, happy consequence for her mindful attention to her body. The pride was evident on her face and in her voice. It was a well earned and deserved pat on the back. A friend is playing with our magnet tiles. It is time for morning circle, he puts he magnet tiles away. We have circle, snack, playtime and story. My friends are excused to explore in the classroom. 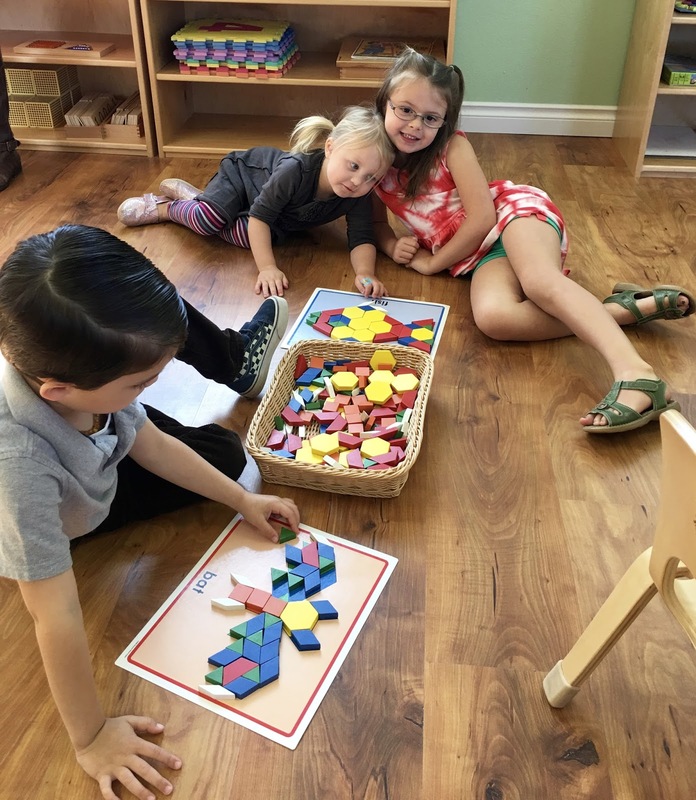 A different pair of children begin playing with the magnet tiles. Morning friend gets very angry, he is in tears for this entire interaction. Morning friend: NO! I was playing with those. Boy 1: We are playing with them. Morning Boy: I was going to build a ship and now you destroyed it you can't play with them. That was mine. If you don't stop I'm going to hit you. Me: I can't let you hit him. I can help you find something to hit. I can't and won't let you hit your friend. Morning Boy: I'm so angry HE makes me so mad that he is building with them. Morning Boy: Can I share? Boy 1: No. I want to play alone right now you are yelling at me. Morning Boy: You are making me yell at you. Me: You are choosing to yell, you could choose to lower your voice. He doesn't feel like sharing, you are feeling angry. What can you do? My very angry friend continued to sit angrily by as his friends played. He chose to spend a good portion of class time sitting and being angry. I chose to sit with the boys, to offer quiet reminders of what we can do with our hands, and ways we can say things more kindly. Morning boy was able to listen to me and sit calmly but angrily while his friends played. Not the best outcome, but I felt it was successful. While the class was washing their hands to get ready for lunch, Boy 1 brought it to our attention that Morning boy hit him while they were getting their hands washed. Me: Can you tell me what happened while you were washing your hands? Morning boy: I hit him. Me: Thank you for your honesty. Can you tell me why? Morning boy: He never shared and I'm still so angry at him I never got to build my ship. Me: You had done a really good job of using your words, I'm feeling really sad and frustrated that after all that you chose to hit him. IF the magnet tiles are going to cause such anger I may need to think about taking them out of the classroom, they can't be the cause of someone getting hit. Morning boy gathered his lunch and came to join us, there were 2 choices- a chair by Boy 1 or a chair at the far end of the table. Morning boy looked at Boy 1 and at me, I asked if he felt he was calm enough to sit there; he choose the spot at the end. I told him I felt that was a good decision. This situation did not resolve itself in a huggy, lovey way, but it did end in a manner in which this young boy was able to do some self reflection and saw that he was still very angry. For a 5 year old, that is a success. It is repeating this process, having these types of conversations, as often as needed, that leads to kids finding solutions on their own. Expressing happiness and excitement comes easy and with freedom for young children. Expressing more negative emotions can be difficult. 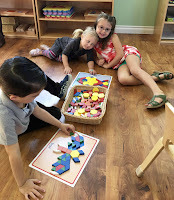 The more practiced they become in identifying their feelings, finding positives strategies to express those feelings, and developing communication skills to solve their problems, the greater success they will have on our playground, in kindergarten and in life.